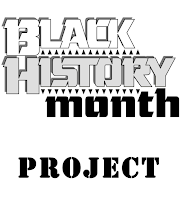 Our month has been filled learning about extraordinary African Americans who have made tremendous contributions in their fields. They loved reading about Jackie Robinson (baseball player), Charles Drew (developed blood bank), George Washington Carver (over 100 ways to use peanuts), Dr. Mae Jemison (astronaut), Marian Anderson (opera singer), Harriet Tubman, and the list goes on. We are still fully engaged in our readings and discoveries. My kiddos are mesmerized, inspired, moved, and motivated. Their conversations evolve around--"What difference can I make?" I know, that we all do not grow up to become famous and have books written about us, but all contributions, big and small, start with a spark and I hope I have ignited that in my students. My favorite part was listening to them present their person to the class. They were very eager to share what they learned and why their person was famous. If you are interested in the project directions that went home with my students, simply click on the picture below.